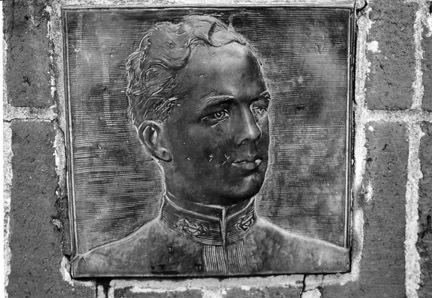 Charles Emerson Hovey, a bronze portrait relief of the war hero from Portsmouth, NH affixed to the edge of a fountain base dedicated to him in Prescott Park across from Strawberry Banke. Frederick Warren Allen, Sculptor, 1918. There is a relationship between the portrait reliefs of Ensign Charles Emerson Hovey (1885-1911) and Etheldreda Downing Hovey Klyce (1880-1917) both by family and by date. William W. Howells, the grandson of the celebrated novelist and editor, William Dean Howells, a good friend of Mark Twain, was married to Muriel Gurdon Seabury who was the daughter of the Portsmouth Rector Henry Emerson Hovey. Etheldreda and Charles were her aunt and uncle. Both reliefs were created in 1917-1918. Etheldreda had died in 1913 and Charles in 1911. 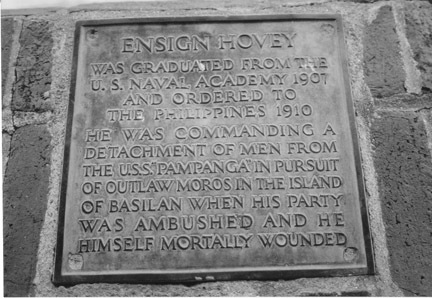 Ensign Hovey was a war hero, born in Portsmouth and killed in the Philippines in 1911. He is portrayed proudly by his family in his dress uniform with two accompanying lettered commemorative plaques, all by F.W.Allen, whose signature appears at the bottom right corner of the portrait with the date it was made, “fecit 1918.” The dignified portrayal is on an uplifting fountain dedicated to him at the entrance to busy Prescott Park on the river where there are many tourists and residents to appreciate his sacrifice. One of two commemorative plaques for the sides of the Hovey Fountain in Prescott Park, Portsmouth, NH, describing the service and death of Ensign Charles Emerson Hovey. His portrait relief is center front. F.W. Allen, Sculptor, 1918. St. Gaudens was an innovator in the difficult art of the bas relief. It is clear that Allen studied his work carefully and used many of his techniques. With inspiration from St. Gaudens and Pratt combined with his own outstanding technical skill and innate aesthetic sense, Allen produced many wonderful portrait reliefs. The memorial to Ensign Hovey in his Navy dress uniform is dignified as befits a hero. Allen believed it was important in times of war and remembering war casualties, to be uplifting. The setting in the park (moved here in 1980) overlooking the water of the Piscataqua River in Portsmouth and the historic gundalow cargo vessel beyond at the dock on the right highlights the history of the city as well as its hero. The Hovey Fountain with water spurting upward from the fish in the hand of a young man in his prime boosts the spirit. An image from a newspaper article in the Archives of American Art (perhaps the original clay) shows more of the body in uniform and more width at the shoulders giving the illusion of looking up to him rather than directly at him. There are other subtle differences in the two faces. The bronze on the fountain is cut shorter at the bottom and narrower at the shoulders. There were two copies made, so the photo from 1918 may be one of the second bronze or more likely the original in clay. Lively surface activity characterized St. Gaudens’ work and here you see Allen’s use of that aesthetic here not only in the groundwork behind the head, but also in the tactile quality of the coat and the details of the hair above his ear. Contrasting with the textural elements, the smoothness of the skin, which lifts his face out of the dark background into the light, gives the relief “color” and brightness. St. Gaudens said “Remember that your background is your atmosphere, and part of the composition, and that the composition should extend from edge to edge of the frame.” (The Reminiscences of Augustus Saint-Gaudens (Vol.2) by Homer St.Gaudens, 1913) Compositionally, note here the technique of the horizontally tooled striations above the shoulders that extend out to the squared edge of the frame repeated in the vertical striations in the braid on his uniform. The technique suggests the brush strokes of a painting. The painter John La Farge encouraged his friend St. Gaudens to treat a bas-relief like a painting in clay. Note that the shoulders are a different texture from that of the ground surface layer and extend out beyond the side edges as if there were no boundaries to contain them. Bringing the body out beyond the frame brings the subject out to the viewer and the viewer into the art. The anchor pins at the collar make a statement about Hovey’s status as well as his character. It is a detail without words that has a psychological impact. Here was a hero to be honored for his naval service to his country and to his seaside City of Portsmouth. Dimensions: 10 1/4″ W x 10″ H (three coordinated fountain plaques). Size of second portrait unknown. Medium/Technique: portrait relief, two copies cast in bronze, dark patina. Two lettered plaques cast in bronze. Location: on the low brick wall of the fountain at the entrance to Prescott Park, Portsmouth, NH. The second is in a private collection. One recorded as sold for $100.